The Loma Linda University Health Global Health Institute will host a Global Conversations seminar about the global snakebite health crisis from 6-8 p.m., Thursday, Feb. 15, at Damazo Amphitheater at Centennial Complex. 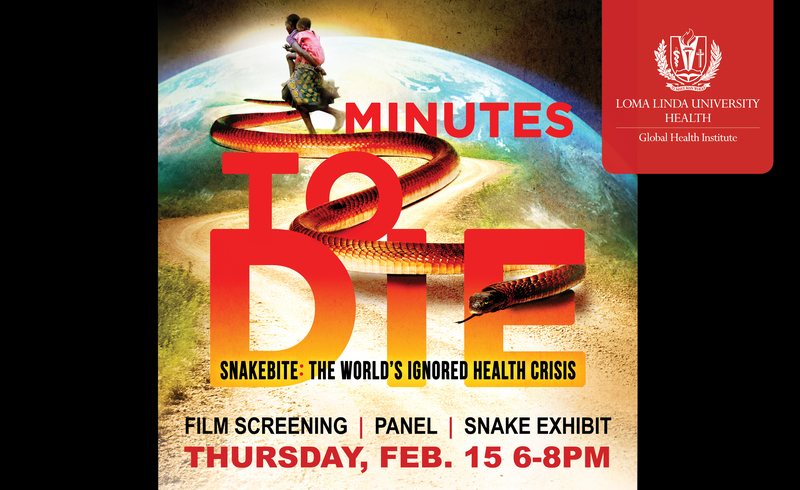 The event will include a screening of the film “Minutes to Die, Snakebite: The World’s Ignored Health Crisis,” a panel discussion with snake venom researchers and experts, and a live snake exhibit. Immediately following the program, the first 30 registrants may tour the on-campus Earth and Biological Sciences Laboratory, which houses venomous snakes from around the world. Snakebite is the cause of death globally for more than 10,417 people each month — over 125,000 deaths a year. In addition, some 400,000 people each year will suffer from life-long health complications such as disfigured limbs or amputation. Victims are often shunned and marriage for young girls becomes unlikely. In nearly every snakebite endemic country, costs for treatment force families into years or a lifetime of debt to pay for medicines, hospital bills or long-term care. Snakebite is a constant fear among global citizens in rural areas — farmers, children and homemakers — as interaction with venomous snakes are inevitable as snakes seek for food sources among crops and water inside thatched homes. In 2017, the World Health Organization (WHO) added snakebite to its list of Neglected Tropical Diseases (NTDs). WHO requires governments of snakebite-endemic countries to make snakebite a priority by providing their people with an available supply of quality, effective and affordable antivenom treatments. For additional information about the event, call 909-558-9770 Ext. x49770 or email jsilva@llu.edu.